B.GOOD and Freight Farms collaborated to develop a custom program that is optimal for both parties. This new partnership combines Freight Farms’ food production capabilities with B.GOOD’s commitment to fresh and local produce year-round at a consistent quality and quantity. This is Freight Farms’ first foray into food production, a long-awaited expansion of services for a company that primarily develops hydroponic hardware (the Leafy Green Machine™) and farming software (farmhand®). Freight Farms and B.GOOD’s program officially began April 10th, 2018, as trucks distributing Freight Farms hydroponic lettuce spread across New England to the majority of B.GOOD locations. Freight Farms will supply B.GOOD with 115 pounds of hydroponically-grown Bibb lettuce every week. The Freight Farms produce will be making its debut on the popular Cousin Oliver sandwich, a staple of the B.GOOD menu. Freight Farms Bibb lettuce on the Cousin Oliver burger. Available in select New England stores starting April 11th, 2018. Freight Farms' hydroponic farmer, Francesca, harvests lettuce from on of the container farms' 265 crop columns. Bibb lettuce before harvest. The plants get 18 hours of sunlight-mimicking red and blue light, nutrient rich water, and ideal growing conditions. As a result, plants grow quickly and 95% of each harvest is ready to go to market. Freight Farms Bibb Lettuce makes it onto the B.GOOD chalk board as a local supplier! "We love when we can get involved in sustainable farming. We have been working with Freight Farms on and off for the last few years and have had a great relationship. We love what they do and we are excited to continue our partnership. We're excited to be able to source local, sustainable produce year-round from a farm right here in Boston for our signature burger." This partnership highlights both companies’ dedication to their long term brand values. 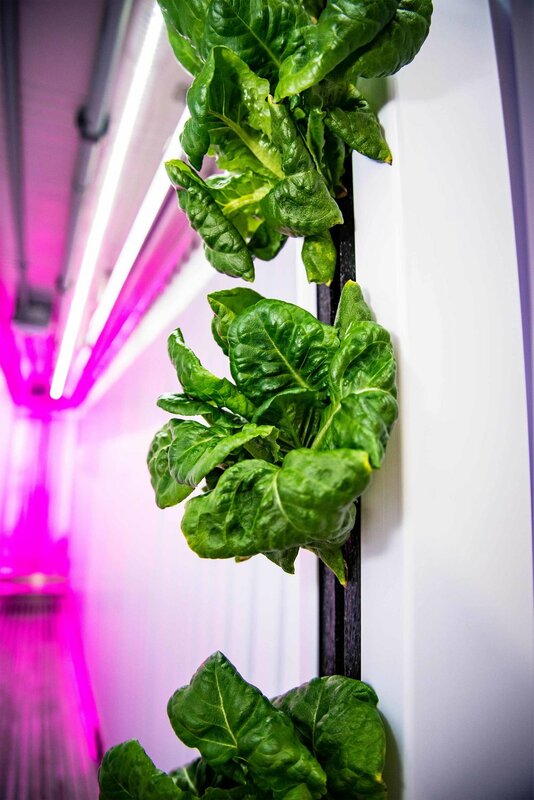 We developed Freight Farms technology with the goal of giving anyone the ability to “Grow Food Anywhere.” The Leafy Green Machine makes growing and sourcing local and fresh food a viable option for any individual or institution. 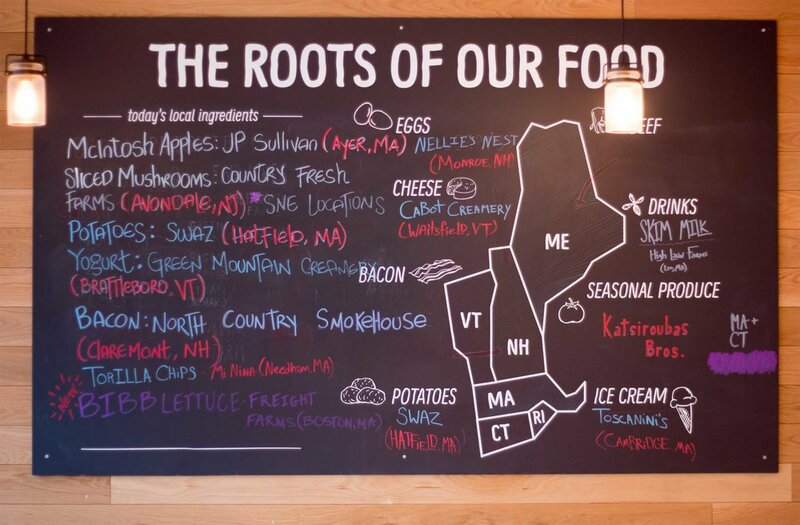 B.GOOD’s complementary values revolve around “Food with Roots:” By sourcing sustainably and cooking seasonably, they are able to support their community of farmers and eaters while creating fresh, balanced, and tasty food. Together, Freight Farms and B.GOOD actualize their goals of growing fresh and clean food to feed local communities. Freight Farms CEO, Brad McNamara, with B.GOOD Director of Purchasing, Joe Ackil, celebrating the arrival of Freight Farms produce at one of B.GOOD's Boston locations.